The Michigan Botanical Club sponsors dozens of presentations and programs throughout the year. Four of our five chapters organizes monthly presentations featuring presenters and speakers that are at the cutting edge of botanical research and exploration. The Great Lakes Chapter is a "cyber chapter" and serves members outside the geographic areas of the local chapters. 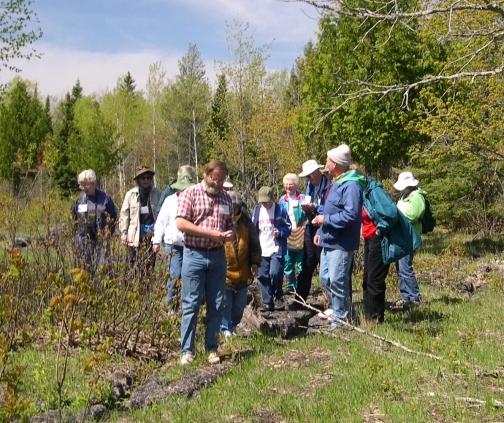 A rich variety of field trips are offered as well, highlighting some of the truly unique natural areas in Michigan and the surrounding regions. Our programs tend to be very academic, but they are certainly geared towards feeding inquisitive minds at all levels. These presentations are usually offered free of charge and are open to the public. Occasionally, we will offer joint programs and field trips with other clubs and organizations that have similar missions. Check out the chapter pages for programs in your area. At the state level we offer several major programs each year. These meetings are called Forays, and they are typically focused on a discrete region, often just a couple of counties. These areas are chosen for rich and unique habitat and flora. The program offerings at these meetings is very heavily weighted towards field trips, and the trip leaders are often researchers who have spent significant time working in the destination. This is the big event for our club, and it is the largest gathering of veteran Michigan Botanists. Held every year over the Memorial Day weekend, the location varies from year as each chapter takes a turn hosting the foray. This event features three days of field trips, and evening presentations by some of the best and most accomplished Botanists in the region. Due to the size of this event, there is a modest charge for these programs; club membership is also required. Field trips are offered in a variety of difficulty levels, meals are offered, and we are able to provide discounted accommodations at local hotels. This event is usually held in the late summer or early fall, and it is a smaller version of the Spring Foray. The format is similar, very field trip intensive, academic, and lead by experts in the field trip destination. Click on the links to the left for more information.